I have spent the last 7 years living my very best job, I have had the most amazing opportunities and I have worked with some really inspirational people. Things have definitely changed over the last 7 years, with video becoming increasingly more popular. When I first started it was me that was pushing how important it was to have a video to showcase a business or event – now the whole world is telling everyone that they need video. When I came back to Peterborough to start working locally, barely anyone had a video, now it is quite the opposite. Of course I wouldn’t be here today if it hadn’t been for some really lovely people helping me over the years! I have had huge support, in many ways, from my parents – they continued to feed me for one when I first started. But it’s not just my wonderful parents that have been a huge support, it has been my whole family, from my brother, to my aunties and uncles, to cousins, and even in-laws – Amy that is you! From recommendations to shares of posts, to words of wisdom and even some of them have been a second camera operator on occasion. They have all been there pushing Ellen Jackson Videography to do well. From there I want to thank the people I have met through my business who have been absolute diamonds in helping me through the past 7 years. My first shout out goes to Anna from Quibble Content, who has been a saviour to me on many occasions, from website SOS, to help and advice. She even inspired me to write this blog. Then we have to give a shout out to Gary Johannes who practically dragged me kicking and screaming to join EnAct, but what a wonderful opportunity that was. I met some really wonderful people in that group, who since leaving I have remained very close with. Thank you to Ally, Jamie, Steve, Kristian, Paul and Gary, for all the really helpful advice you gave me over the years, enabling me to really push and grow my business. And to Shelley as well from the creative marketing studio, who not only gave me great advice as part of EnAct but has continued to do so since. 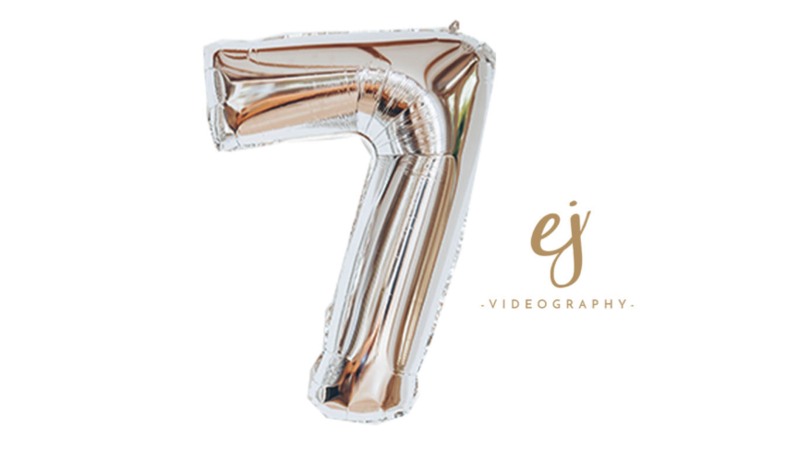 Other thank you’s go to Simon for enabling me to buy my top of the range equipment by advising me on grant opportunities and to Lauren for countless amounts of help with my branding and for of course making my fabulous logo when I rebranded at my 5th anniversary. To Polly for always being at the end of an email when I need Quickbooks help, to Tim Steele for lending me lenses on occasion and referring me countlessly for video work. There really are so many more people I could thank, but you’ve probably read enough already … ok maybe just a few more. Ann Hovell for taking me under her wing at one of my first networking events, and always introducing me to new people, to Hazel Cottrell, Lucy Banwell, Felicity Francis, Danielle from Revamp, and all the smiling faces that greet me whenever I get out networking. And with your continued support… hopefully I’ll be here next year writing about my 8th anniversary! Well done for reaching such a mile stone, your thanks is appreciated very much. However you’re the one who took the support and used it well and in turn supported so many others. You’re a rare kind in the business world. Good luck with the next 7 yrs. Thank you Ellen. So happy for you! Congratulations. Thank you, and thanks for all your recommendations.